Looking back on the past five months of traveling the Americas, it’s been a tremendously rewarding experience. There have been very good days, and some more difficult days, but I wouldn’t trade any of them. Many people have asked what my favorite country has been so far. It really depends on what aspect you’re talking about. Most beautiful? Overall I’m still putting Colombia at the top of that list, although Peru has been pretty awesome so far, and I’m not through it yet. Friendliest people? They’ve all been great. Colombians and Mexicans really went out of their way to be friendly….everyone I came in contact with. I’ll never forget sitting at stoplights in Bucaramanga, Colombia and having people pull up next to me, both on bikes and in cars, and give me a thumbs up while screaming “Bienvenidos a Colombia!”. Best food? Personally, I’m still a huge fan of Mexico. Although Peruvian ceviche has been incredible, and I had a few great meals in other countries as well: at a guesthouse in Panama, on the beach in El Salvador, and several others I can’t even recall right now. It’s probably not fair to rate a country based on its’ food when your budget is as low as mine. I’ve met a lot of great people on the road, from locals who were just curious where I came from and where I was going (the little girl at the gas station outside of Chimborazo, Ecuador especially comes to mind — wide-eyed and having fun talking with me in Spanish), to innkeepers like Aase and Ove at The Magic Stone in Banos and Anja in Vilcabamba, to the other travelers I’ve met and even traveled with along the way. Especially Judith, the “Swiss Girl” who rode from Alaska to Chile on her own (except when she allowed me to tag along). Judith will always have a special place. It was a great trip and I hope to see her again when I get to Switzerland. I’ve also enjoyed traveling with Ian from Scotland, and hope to meet up with him again closer to Patagonia, and hopefully in the UK as well. I feel like I’ve made a lot of new friends on this journey; people that I will see again either down the road or in their hometowns on the other side of the world. And wherever I land when the trip is done, they will all be welcome there as well. I also want to say thanks to all of my friends back home that have followed along on my travels, and those who have offered assistance during my trip, should I need it. So far, my bike has been great and I haven’t had a need to call for help. But you are not forgotten. 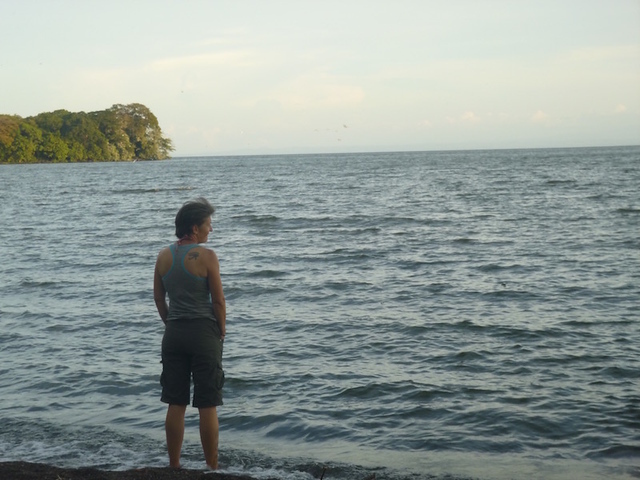 In just the first five months of my travels, I have seen and experienced a different lifestyle than I have ever lived before, but I have adapted to it well, and it feels good. As if to confirm that this life fits me well, I am healthier than I have been in years. In addition to losing 25 pounds since July, my primary health problem seems to have cured itself: when I left Texas in July, my PSA level (the number used to measure prostate condition and possibly indicate prostate cancer) was 50. The normal level is closer to 4, and typically a level of 50 indicates the existence of prostate cancer is highly likely. This past Wednesday, after five months on the road, my PSA level was measured again, and I am at 2.8. My doctor has no explanation for how my number has dropped so far, or why my PSA is well within the normal range now even though my biopsies in July showed a pre-cancerous condition. I will chalk it up to a change of diet and a severe reduction in the stress levels in my life. Which gives me a lot to be thankful for as I continue to ride. I hope your holidays are bright, and you make plans for the new year that change your life in a positive way. This morning I visited the US Embassy in Lima, Peru. My passport is running out of blank visa pages, and I needed to add some before heading towards Africa in March. Since I had several days in Lima, I thought I’d try to get it done here. Also, I just learned a few days ago that the United States will no longer allow additional visa pages to be added to a passport beginning January 1, 2016, so I just made it before that deadline. Otherwise, I would have to apply for a new passport, which is difficult time-wise when you’re moving fairly quickly through multiple foreign countries (ie, they keep your old passport until you get the new one, so you can’t cross any borders). I’d never been to a US Embassy before. Boy am I naive for my age. I had visions of US Marines guarding the entrances, and me being ushered back to sit at a desk before a US government official in a suit with a US flag lapel pin, who would interrogate me, asking me a series of questions about why I was in Peru, where I was going, and why I needed to add pages to my passport, before stamping an official form and sending me through yet another military checkpoint to another building embedded even deeper in the compound. Uh, nope. When I arrived at 7:30am, there were two lines outside the gates: one for visas, which had about fifty people standing in it, all holding large manila folders of documents. The other line said “American Citizens”, and had about ten people ahead of me. I was clearly the only Gringo present. Anywhere. There were a couple of armed guards, from a private Peruvian security firm. My passport was checked by an Embassy employee, also clearly Peruvian, and I was asked some questions, in Spanish. Then I was ushered through a door to the security checkpoint (a metal detector). Again, all operated by Peruvian nationals, all in Spanish. Once through the checkpoint, I was instructed (in Spanish) to go to the large doors on the right, and through yet another metal detector, then into a room that looked suspiciously like the DMV. Take a number, have a seat, wait for your number to be called and proceed to one of the four windows. Or rather, “Numero cuarenta tres, a la ventanilla dos”. Yep, no English yet, and not a Gringo in sight, on either side of the windows. Or a Marine, for that matter. My illusions of US force on show was shattered. In any case, I was able to apply for my additional visa pages for my passport, which should be ready tomorrow afternoon. My second thought was, how did I make it all the way to Lima, only to find out by chance at the US Embassy that Machu Picchu will be closed in April? Shouldn’t this knowledge be more public? Well, by April I hope to be in South Africa and/or Namibia, so it doesn’t affect me. Now I wish I could get that John Candy scene out of my head. 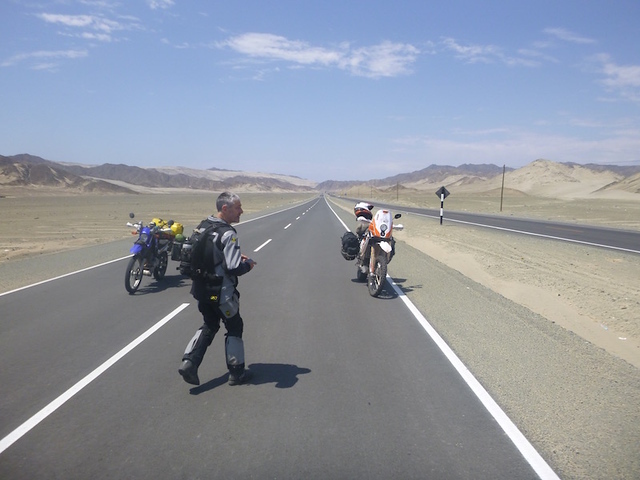 Before I began this trip, while still in the planning stages, I attended a couple of events where people who had ridden around the world or were in the process of doing so gave presentations. One of these events was Overland Expo in Flagstaff, Arizona; the other was a Horizons Unlimited meet in British Columbia. 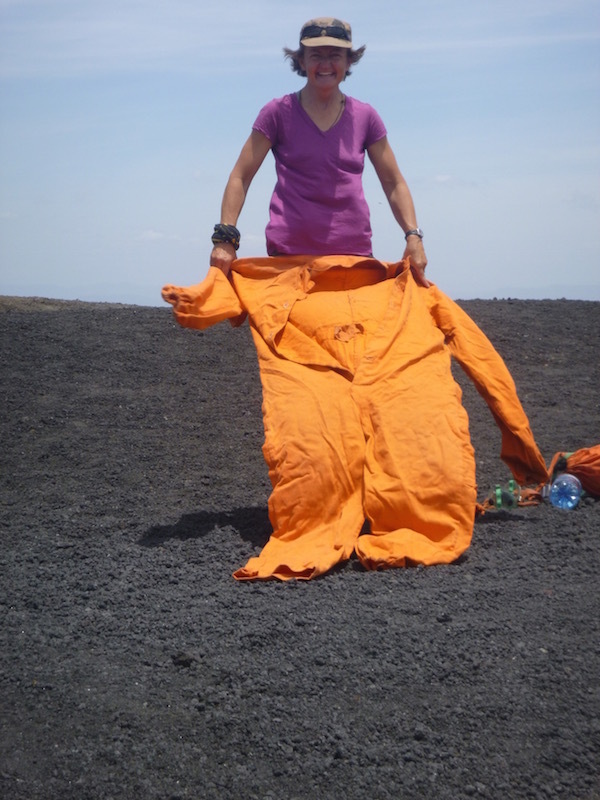 At both events, I heard a recurring theme from multiple speakers: that of travel burnout. I had noticed this in several blogs I had been reading as well. It seemed like most people hit a lull in their travels somewhere between six months and eighteen months into their trip. Determined to prevent this, I built some “time off” into my schedule. I told myself in the beginning that I would try not to ride more than 250 kilometers a day, and try not to ride more than four days a week. I haven’t been totally successful in either one of those, but I’ve done a pretty good job overall. The next leg of my journey ramps up the mileage and reduces the days off: no more taking a week to stay in one place. Beginning in January, I will need to cover just over 9,200 miles in 62 days. That still keeps me just under my 250 km/day limit, but I won’t get many days off unless I can cover more miles in a day. And I want days off between January and March because I will be in Patagonia, with some absolutely gorgeous scenery. So in preparation for the next leg, I am taking a few weeks off. This will allow me to do some “housekeeping” chores, including obtaining my carnet (“car-nay”) for the bike, which is necessary for Africa. If you’re not familiar with a carnet, it is essentially a posted bond or guarantee that you will take the motorcycle back out of the country and not sell it while there. I also have to obtain a visa for Tanzania, the only country in Africa I will visit that requires a visa application in advance rather than obtaining it at the border. In addition, I need to add some pages to my passport, as I’m running out of blank pages, and some countries will not allow you into their country unless you have a certain number of blank pages. As with many other aspects of this trip, these rules change as I go. For example, the United States just announced a couple of weeks ago that they will no longer offer extended pages for passports beginning January 1, 2016. The carnet process, which is difficult at best (and expensive), continues to get even more difficult: you can’t obtain a carnet in the United States. Until recently, U.S. citizens had to obtain a carnet through the Canadian Automobile Association. In March the CAA announced that it was no longer issuing carnets. So I applied through the Royal Automobile Club in London. Two weeks ago, the RAC announced it would no longer be issuing carnets. I also have some medical follow-ups that need to be done before the end of the year, and this will require a return to the States. The bike will be stored in Peru while I do some alternative traveling. I have a 90 day permit, so I have until February 16, 2016 to get out of Peru. Plenty of time. Last night I rode a Hatun Pillko “Bus Cama” (literally Bed Bus, or Sleeper Bus) overnight from Huánuco to Lima. It’s a ten hour bus ride. I’m typically not into public transportation, or buses in general, so I was amazed at the comfort of the bus. 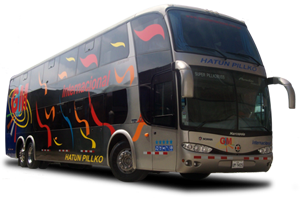 You see these giant double-decker buses everywhere in Latin America. This is the first time I’ve been on one. It reminded me of riding the Shinkansen bullet trains in Japan. The bus was extremely quiet, and extremely smooth. They served a snack and drinks, had free wi-fi, and showed a movie (oddly, a Korean film with Spanish subtitles). The seats are somewhat like Business First class on international flights: they recline to nearly flat, and have a foot platform that joins to create a full bed, with partitions between seats. I have to say it was the most comfortable I’ve ever been on a form of ground transportation. At least once I got over the fear of riding in a bus in Peru. You have to remember, for the past couple of weeks, I’ve been on the other end of these behemoths, staring them down as they flew toward or past me. Very common sight throughout Latin America. The sight of one of these struck fear as a motorcyclist, but as a bus passenger, there’s no better way to go. 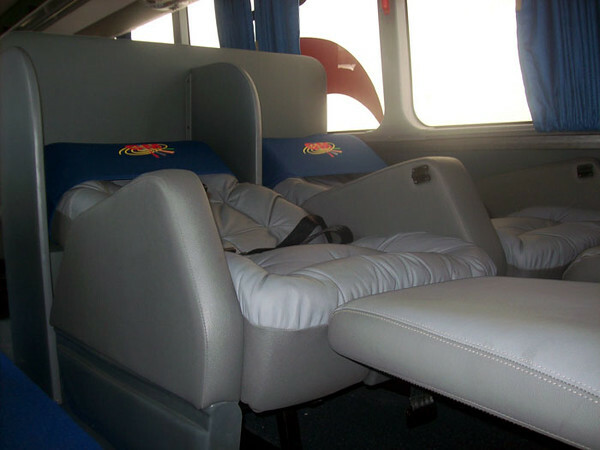 Sleeper bed on the bus. Very comfy. I arrived in Lima this morning and went to a concert tonight: one of my favorite California bands happened to be playing in Lima tonight. It was worth the experience, to see an audience of around a thousand people, most of whom don’t speak English, singing every word of their songs in English. 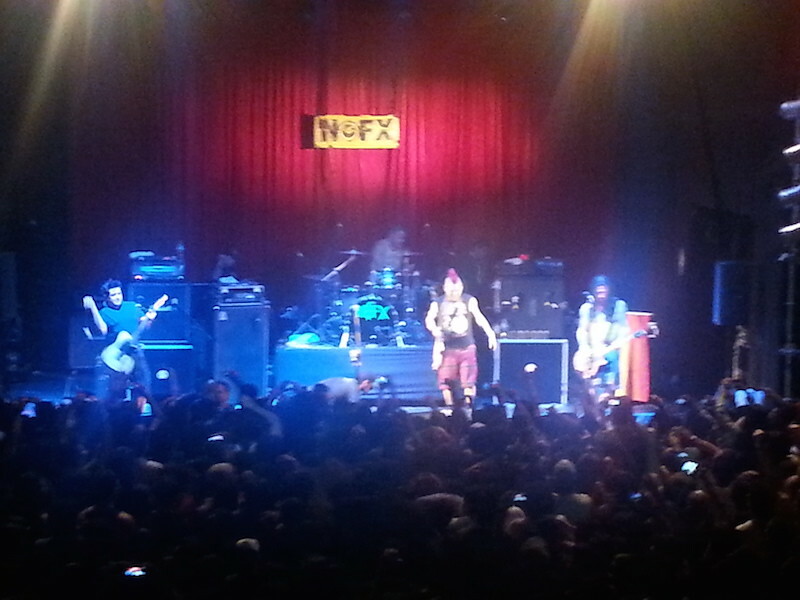 NOFX in concert at the Barranco Convention Center, which looks a lot like a House of Blues inside. Lima is a large city. Miraflores, where I’m staying, is very clean and metropolitan, with a Starbucks about every three blocks. As I’ve mentioned before, I’m not much of a city person, but this one feels comfortable, at least for the short term. So as I head off on intermission, don’t forget to check back here. I may not post much over the next few weeks, but I will hit the road again in Peru on January 8th and the following six or seven months will be a much faster pace, through Patagonia, Africa, Europe and Central Asia. Stay tuned….and thanks for following along. Another brilliant day that is hard to describe. The sheer scale of everything here in Peru is indescribable. Photos just don’t do it justice. 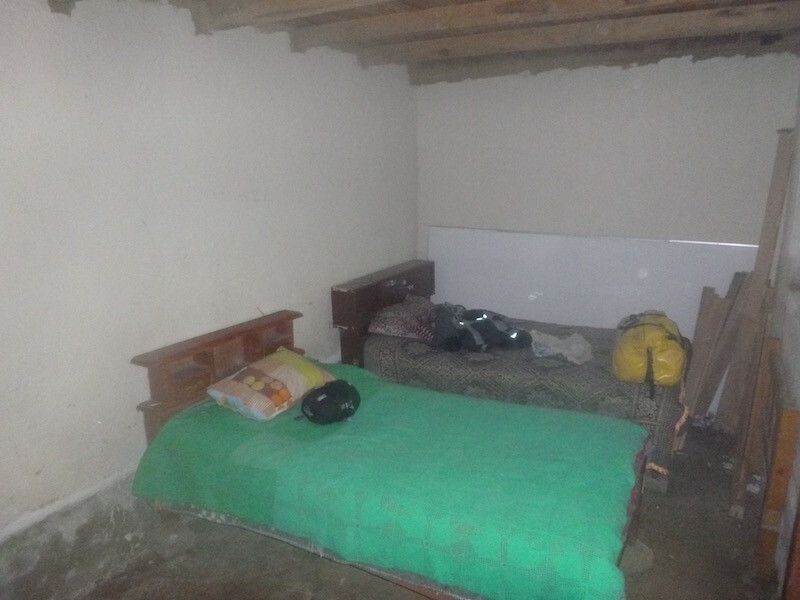 Ian and I headed south from Huaraz (a bit late…his bike was securely locked in a garage — so securely that nobody could find the gentleman with the key to the garage). 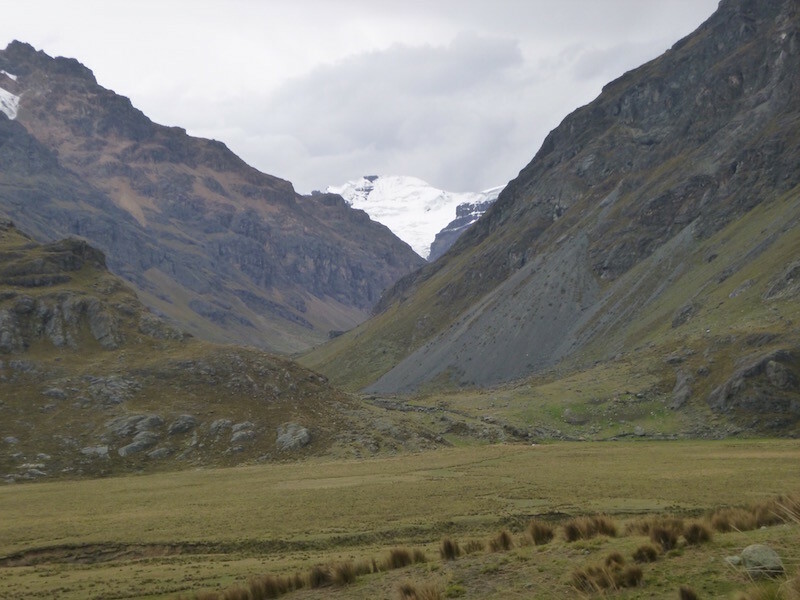 We turned into the Huascaran National Park again just south of Catac, and began the climb over the pass near the Pastoruri Glacier. When we turned off the highway, the temperatures were feeling a bit like summer at high elevation; probably in the low 80s. But we could see the snow-capped peaks in the distance. A surprisingly large number of service station attendants are female. 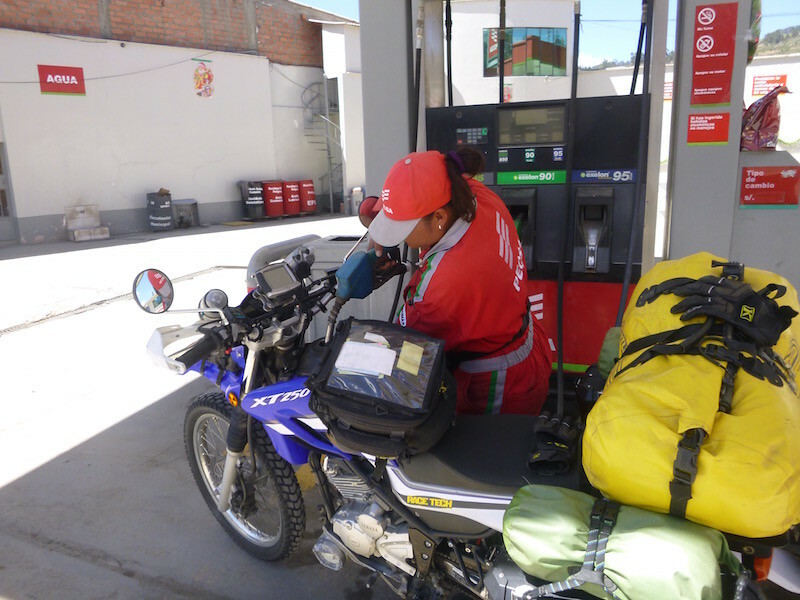 Pumping your own gas is nearly non-existant in South America. 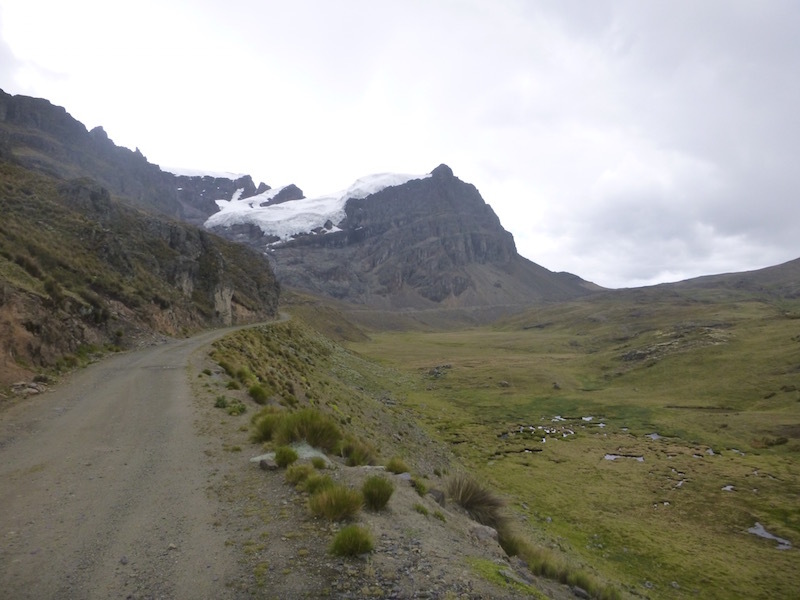 Just turning off the highway onto the gravel road through Huascaran National Park. It’s about 27 miles across the park at this southern point. As we began to climb towards 16,000 feet, the temps dropped of course. The only real complaint I have about my Klim Badlands jacket is that it’s necessary to take it off in order to zip up all the vents. Not terribly difficult, and I suppose it still beats the time it takes to put on a separate rainsuit if it starts raining. The scenery was no less stunning than Monday’s ride through the park further north. I wasn’t expecting quite the temperature change we experienced though: when it began sleeting, I thought it would stop quickly. At this point, it was starting to sleet. When it started snowing, and accumulating on the ground, I knew it was going to be an interesting day. We crossed the pass at just under 16,000 feet, and stayed above 14,000 feet for quite a while. Heated grips are nice, but heated gloves would be much nicer. Heated grips don’t heat the tips of your thumbs, or your forefinger if you have it on the front brake or clutch lever. They also don’t do much to keep the backs of your hands warm. But I’ll certainly take them over not having them on days like this. 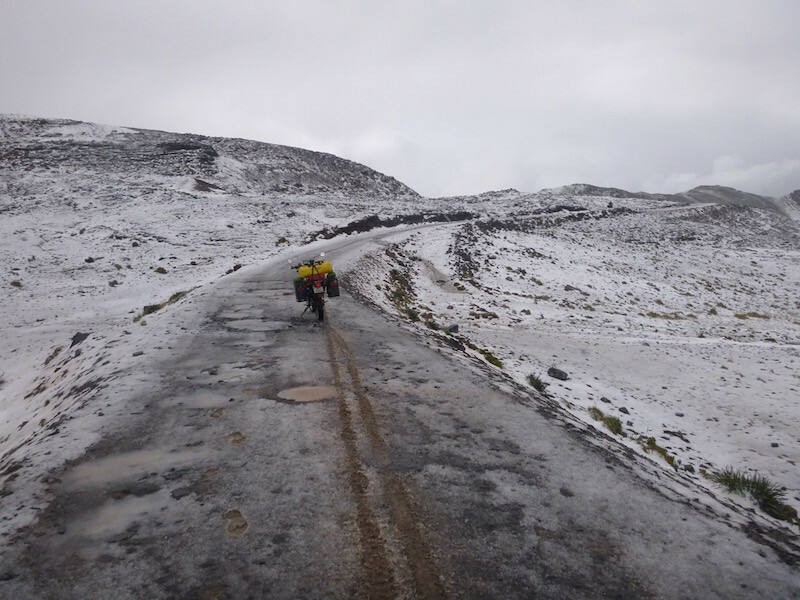 Eventually we dropped down below the snow and sleet, and hit the pavement for a brief distance. At the end of the pavement at La Union, we didn’t see any hotels that looked like they might have secure bike parking, so we continued on toward Rondos, climbing back up the mountain past some beautiful green fields and farm land. Which is when it began to hail. Not big; just larger than pea-size. But at 30mph it still hurts. Slowing down helped, but the road quickly became muddy, and the pelting continued for more than 30 minutes. No photos here…it was getting late and I had no desire to stop in this weather. We pulled into Rondos before dark. Rondos doesn’t even show up on many maps. It’s about five or six blocks long by about six blocks wide, with the typical central plaza. There isn’t really a hotel here. There is a small bodega (store) on one corner of the plaza, and the gentleman there rents out rooms, and has a small room to store the bikes inside (it only holds about three bikes, and there were three inside it when we arrived. He removed two of them so we could park inside. No idea where they went). Lacking any other choices (we had planned to camp, but it was too wet, and looking like it might continue to get wetter), we took a room. It looks better in the photo. Dirt floor, no electricity, but not raining in here. Oddly, the bikes were parked on a tile floor. This was the first town I’ve been in where I felt uncomfortable. Everywhere I’ve been up to now, the locals have been incredibly friendly and curious about me, my bike, my travels, etc. No one in Rondos spoke to us. We definitely felt like outsiders and unwelcome. It was very odd. That said, we didn’t have any problems. It just felt different from the usual welcome I’ve experienced the past few months. To be fair, this is not a town on the typical tourist trail. The next morning we continued on from Rondos to Huanuco. The first 20km or so was a dirt road used so little that it was mostly covered in grass. This might sound odd or made up, but it’s not: at one tiny village, I literally wasn’t sure if I was still on the road, or on the soccer field. One seamlessly blended into the other. Just as I was about to snap a photo of Ian riding under this fallen tree, a branch sticking off the tree grabbed his helmet and threw him off. No damage. Up and rolling again. 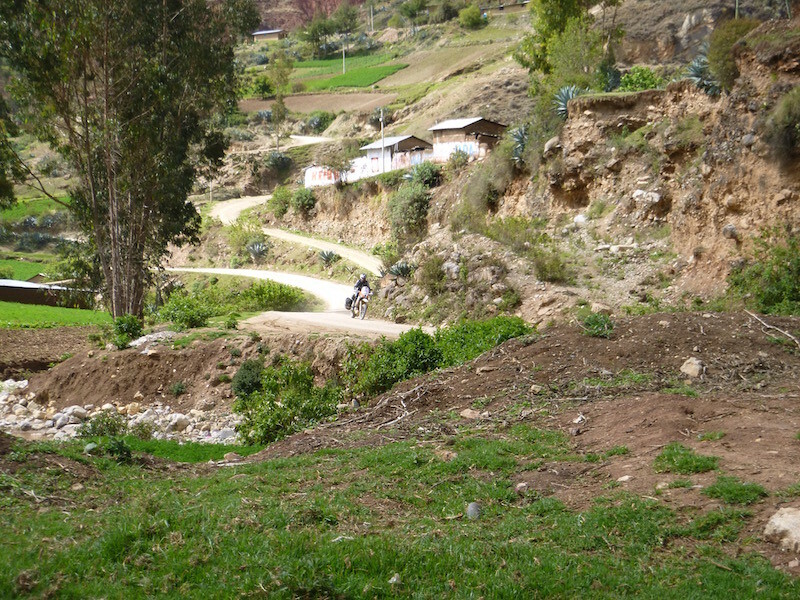 The unused road eventually joined into a much more traveled dirt road, and we continued on towards Huanuco. Even the road workers patching the potholes on this dirt road were friendly, waving and giving us thumbs-up as we passed. 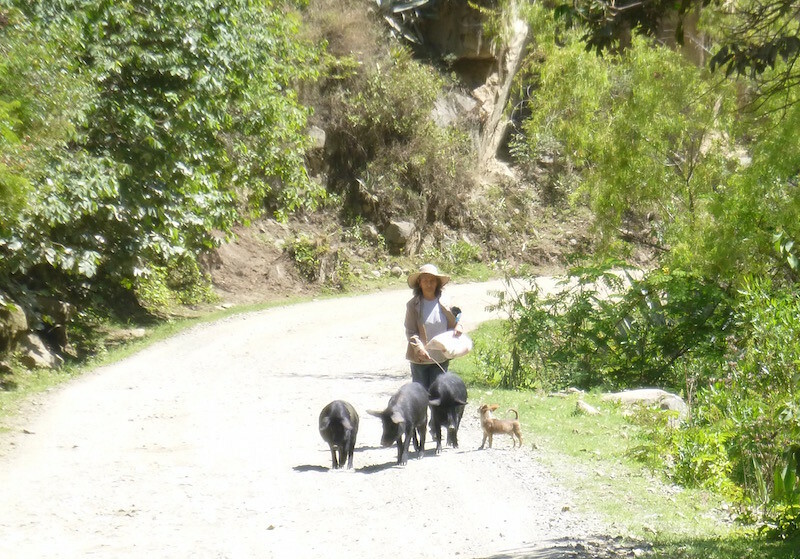 This is extremely common: a woman walking pigs or sheep down the road, usually accompanied by two or more dogs. At one point today I rounded a corner and a woman was leading two donkeys. I apparently spooked the donkeys before I could slow down and she just tossed the rope lead up into the air and let them go. They didn’t go far, but she wasn’t happy with me. 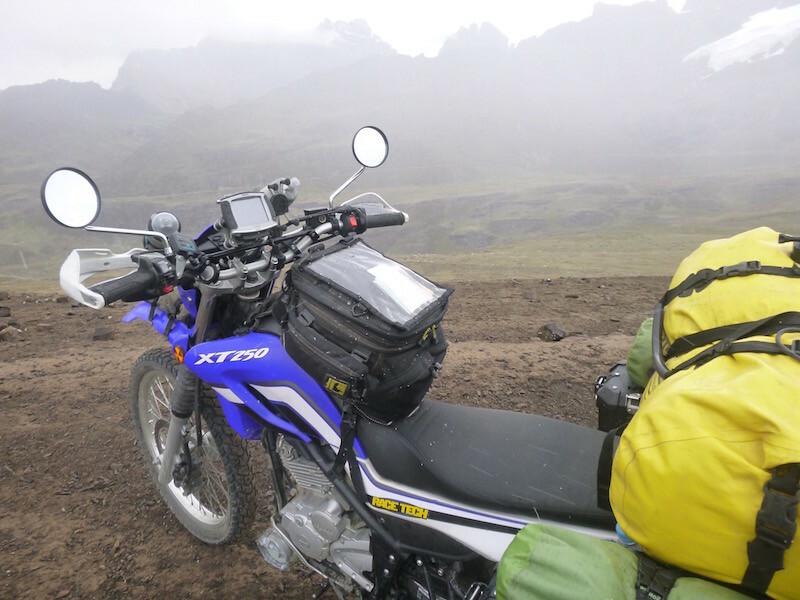 We arrived early in Huanuco, where we met up with Toby of Around The Block Moto Adventures. 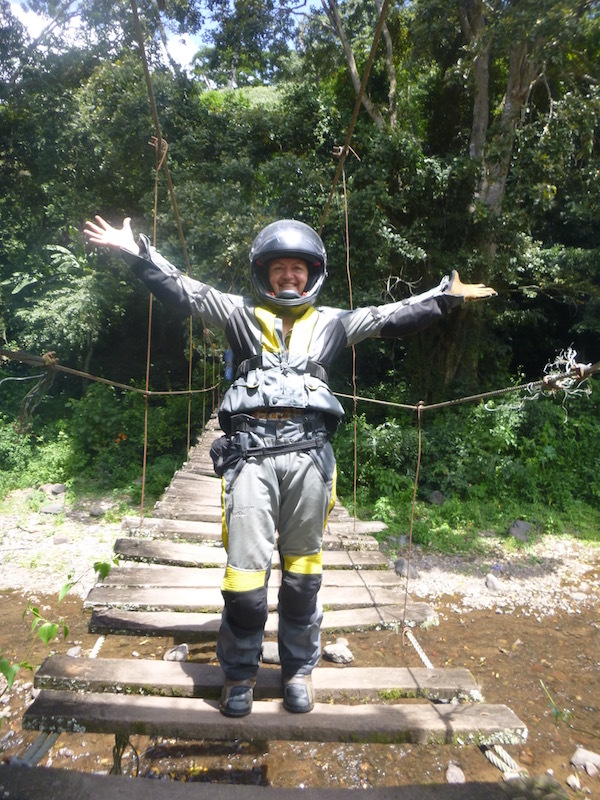 Toby leads guided rides throughout Peru, and rents and sells bikes (with a repurchase agreement) to tourists. He is a great source of trail and road information in Peru, and was nice enough to not only sell me a set of Pirelli MT21 tires this afternoon (it’s great to be back on knobbies), but he also led me to a tire shop that installed them for free (an agreement he has with them as he buys his tires there). I’m planning to spend a couple of days with Toby before heading towards Lima. 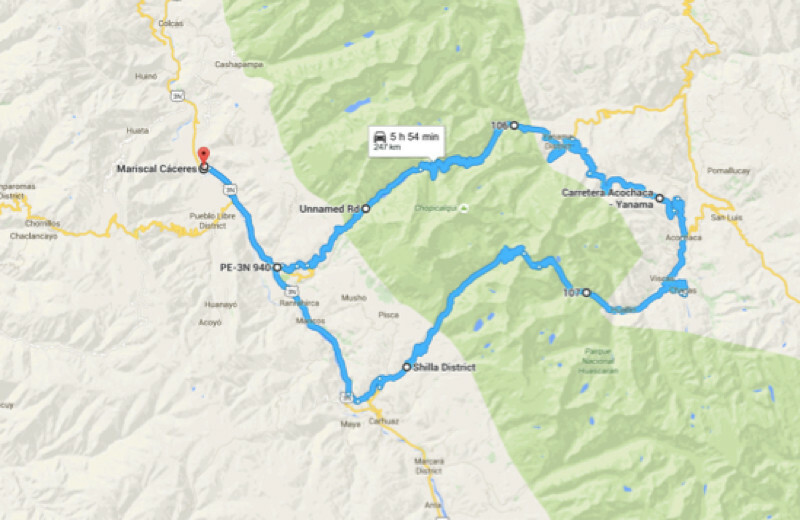 We crossed though the Huascaran National Park twice. The lower (south) road is AN-107, and paved. We took that from PE-3N east. At the summit, instead of passing through the tunnel, we turned off onto the dirt pullout and took a dirt road up over the tunnel. I’m sure at one time you could do this road in a 4×4. Not any more. 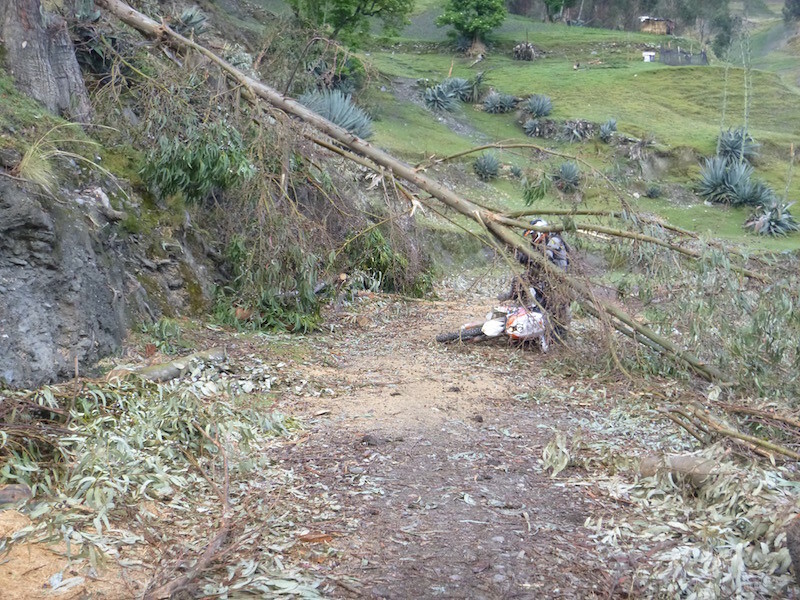 There are large boulders in the road that restrict the width, and areas where the edge has slid away, also making the road too narrow for more than a motorcycle or mountain bike. On the east side, before Acochaca on AN-105, the road turns to dirt. 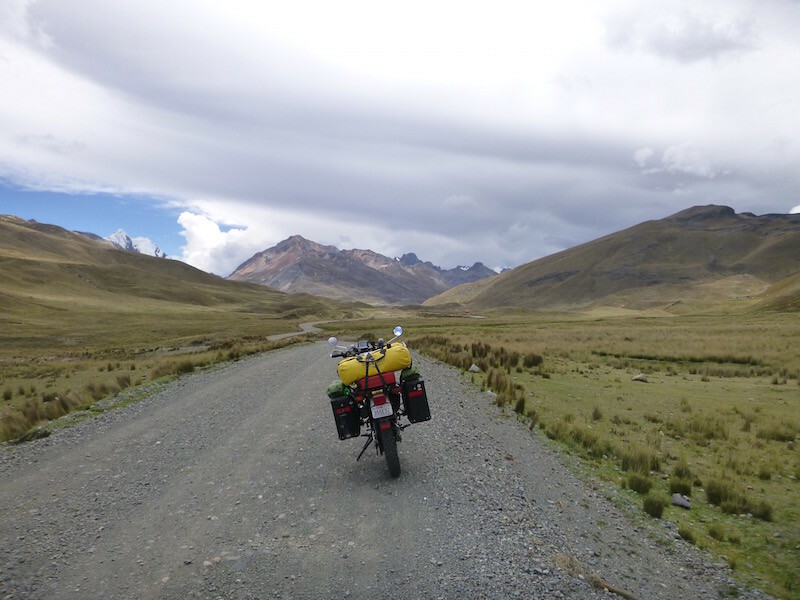 We followed this to AN-106 (also dirt) and headed back west across another summit (and more incredible views of mountains, snow and glaciers), past Laguna Llanganuco to PE-3N and back to Caraz. Well, I did anyway. 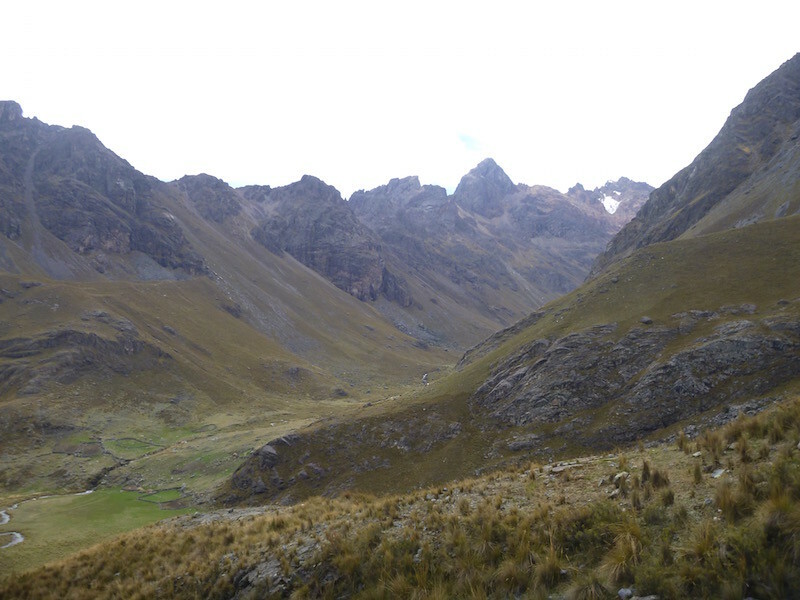 Ian stayed at a mountain lodge that offers some incredible treks not far from the lake. The first 60 miles of the loop is more or less paved, most of it nicely. The last 100 miles is dirt, rock and shale road. Here are three short videos of the ride up to the tunnel, over the tunnel, and down from the tunnel on AN-107. Due to the wifi here, it took me about 14 hours to upload this six minutes of video.